Quick Access Files: Don’t Live an Organized Life Without Them! Last time in “Help, My Kitchen is My File Cabinet”, I referred to the universal problem of overwhelming amounts of paperwork, and the resulting piles that usually end up in the kitchen. A large part of the solution to this problem is the creation of Quick Access Files. Quick Access Files are just that……….files that you need to access often and quickly. Don’t let the word file in Quick Access Files throw you. These are files containing different information than we generally keep in our regular filing cabinet. Quick Access Files are files that you will need for a season and/or you need to access often. They are filled with the papers that are otherwise taped to our refrigerator, stuck on the bulletin board or, all too often, piled up next to the phone or on the kitchen table. 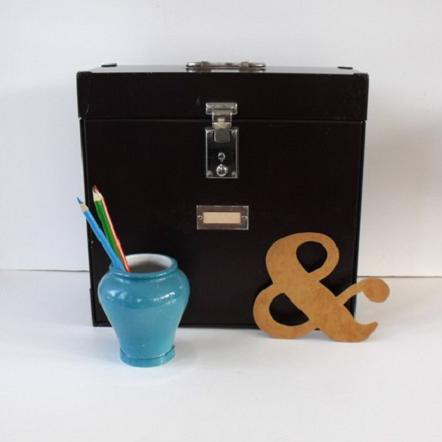 Not Your Mother's File Box! A file for each school, which will hold current phone lists, school calendars, announcements, and newsletters. Or you may choose to create a file for each child in which you could place all their papers for their individual school, sports, and clubs. For many of these categories you will also have a file in your regular file cabinet. For instance, each child will have an Education file in your regular files, in which you will place all their permanent records, report cards and testing information. Each person will have a Medical file, which will hold immunization records, surgery, allergy and all permanent medical records. The papers, invitations, schedules, announcements, appointment reminders, and take out menus in our Quick Access File are generally used for a season and then discarded or updated. At the end of a school year or sports season, for example, most of the contents of the Quick Access File will be discarded. Any important or permanent information or documents, however, will be added to your regular long term filing system, and your Quick Access Files will be ready for the new season. With the addition of just a few categories, with corresponding files, you will have a complete system to deal with your mail on a daily basis. Now that you have created your own Quick Access Files, I suggest that you keep them in your main living area, which is usually the kitchen or family room. This is generally the place that you bring in and drop your mail, you walk in with files and papers from meetings and appointments, and your children bring you papers to sign, fill out and file away. I have heard people say that they don’t want a file box sitting in their living area. May I kindly suggest, that a small, nice looking file box (think attractive and presentable) looks much nicer than a pile of papers in disarray! Check out some of the links to file boxes and files in this article, or find your own. Be creative. There are 100’s of options available in every style. Find your own style. A Beautiful Alternative to Manila! It’s the perfect time for a fresh start!